Yes, We went to Istanbul and here’s my top 15 not-to-miss things! Istanbul. A romanticised history. An orchestrated present. While some claim it’s a city getting overwhelmed by its own history, others argue it’s a street food lover’s paradise, especially because of its history. For me, this was a love at first sight! Every walk I took in the city led me to one cultural slideshow or the other. From mouth-watering food to shopping bestseller rugs to breathtaking architecture to the entertaining Belly dance, everything in Istanbul comes with its own story. There was so much beauty in every shot I took and so much warmth in every conversation I encountered, it could very well be my favourite vacation till date as far as memories are concerned. After spending a handful of days in the city that officially is the melting point of East and West and a testament to three entirely different civilisations, I can now safely assume a know-it-all candidature for myself and gush about my new love that is this country. 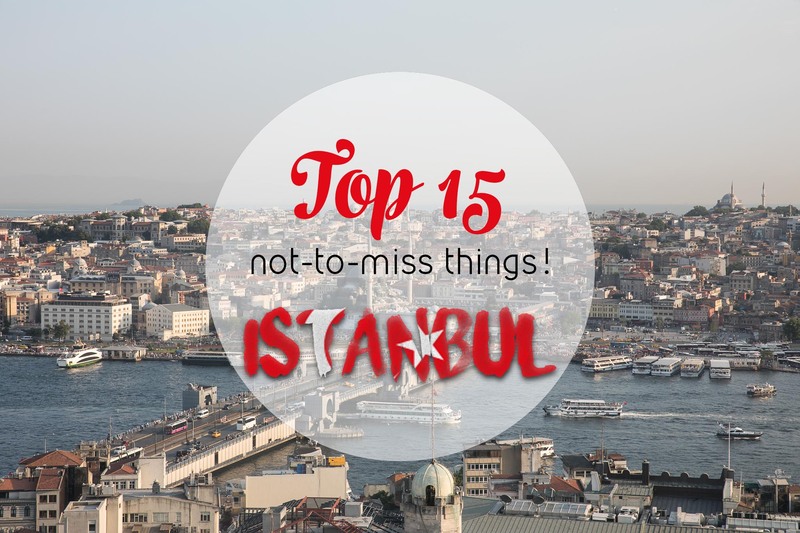 And so, as a been-there-done-that expert, here is my list of must-do you should absolutely not miss while in Istanbul! A landmark as popular for its conical structure as it is for its spectacular panoramic views of the skyline, Galata is not just another tick on your travel attraction list. A peek into the history and a direct check-in to the most current scene happening in the city, an evening stroll around Galata Towers and watching the sunset from the top is an experience in itself. And if that’s not enough, go ahead and take up the virtual helicopter ride for the unforgettable view. Like every tourist, we helped ourselves with snacks and drinks at the rooftop restaurant against the stunning skyline of the city. Perfect for a romantic dinner! Affluent architecture seems to be a signature trademark of the Ottoman empire here in Turkey. But thousands of tourists flocking here everyday suggest they are far from complaining about it. Now converted as a remarkable museum, Topkapi Palace gives you a rather colourful and opulent peek into the lives of Ottoman empire. The ruler lived here with his family (and courtesans) before moving to his new palace, Dolmabahce at the Bosphorus bay. Both the palaces easily draw an audience of 2000-3000 tourists everyday, which only increases around the weekend. But despite the long queues, I strongly suggest you invest your quiet afternoons here. From the finger licking street food (that deserves a separate post) to the internationally famous Baklava and Trilece; Turkey is a foodie’s paradise. Desserts are my weakness, my @cakesutra page gives enough examples of that. I’d recommend definitely a sweet tasting at either Baltepe Pastanesi near the weekly Faith Bazaar or if you’re exploring Blue Mosque and Hagia Sophia, just do yourself a favour and land at Hafiz Mustafa. For here’s where you’d find additional raspberry flavour for Trilece soaked in three different kinds of milk and a great range of Turkish delights. For a wholesome dinner, Al Madina restaurant is a MUST TRY. Beyond the menu, what people love here the most is the unique experience you get here, from the theatrics with which the food is presented to the overall look and feel. If you’re lucky, you might get a surprise dance performance from the staff too! Turkey is so much more than its exotic placement as a tourist attraction. And no, it’s not just all about Grand Bazaar, although a thorough stroll through the market is highly recommended. In the huge market of over 4,000 shops, there is a lot you can find and shop to your heart’s content. The spices were a favourite request for my relatives, while I found myself particularly drawn to the painstakingly beautiful glass lamps. The prices are steep here, so be prepared to bargain! Another favourite is the Istiklal street, and surprisingly, a number of local clothing brands caught my eye. Unisex, great designs and a much cheaper alternative for our regular dose of high street fashion. My favourites were LC Waikiki and Colin’s among others. Also, the outlet malls offer great discounts. I would definitely recommend investing a day at Olivium mall (Zeytinburnu, on the European side) for economy brands, Optimum mall (Goztepe, on the Asian side near Kadikoy district) and Viaport mall (Kurtkoy, on the Asian side near SAW airport) for slightly mainstream and designer brands. Our favourite Tea joint in Grand Bazar! Born as a church and later an afterlife as a mosque, between Byzantines and Ottomans, Hagia Sophia has stood the test of all times. Quite literally. Apart from being a stunning structure to look at, the vibe in and around Hagia Sophia is a boon for one’s soul. My best moment here was to simply catch a seat nearby from where you can listen to the in sync prayer ritual between the nearby Blue Mosque and Hagia Sophia. Photography wise, this area turned out to be one of my favourites for some lovely sunset shots I captured here before heading to Basilica Cistern and Topkapi Palace. The king of the nine Princes’ Islands, Buyukada comes with as rich a history as its title. The island has a strict no-car policy, so you rely on bicycles, horse chariots or your own sturdy feet to explore the scenes, or finding Nemo for that matter. Since we felt particularly adventurous the said day we visited Buyukada, we decided to do an impromptu trek to Aya Yorgi Church as well which turned out to be quite exhausting. By the end of our strenuous route, the only thing that still looked kickass were my new pair of shoes, New Balance 247. Yes, this is not something limited to Istanbul, but after a string of personal experiences, I can assuredly recommend how AirBnB enriches the culture dose whilst at a new country. For our stay at Taksim Square, we stayed with Marcel Martin, a plethora of knowledge and charm. A yoga instructor by the days and a wonderful AirBnB host in his free time, Marcel ensured we didn’t miss out on anything, from amazing shopping cues to even more amazing city stories. But the winner was his special house which is a 100-year old vintage beauty and still refuses to rely upon an AC/fan for keeping it cool even during the hot months. Contrary to the popular belief, Turkey is an officially secular country. So while its predominant population comprises of Muslims, it has a rich history of Jews living here for thousands of years. The Ottoman reign is considered their golden period in Turkey, as this is when Spain banished its Jews, and this is where they found refuge. For those interested in culture and history, there are a number of Jewish Heritage Tours available in Istanbul, historic synagogues and a lovely Jewish museum to spend a lazy afternoon in. Amidst the crowd and chaos in the streets of Istanbul, men find solace at the Galata Bridge with their fishing rods in hands and no hurry in their heads. Everyday, it makes for a gripping view to watch hundreds of locals enjoy fishing, whether as a profession or a passtime, on the top level of Galata Bridge. Just underneath the bridge, there is an equally compelling sight- the fish market selling fish catches of the day. You can rent fishing equipment for a lazy day well spent or simply find a suitable corner and soak in the view. While people marvel at the architectural heritage that is Basilica Cistern, few years ago this largest (survived) Byzantine cistern in Istanbul got a makeover, all thanks to the popular Tom Hank’s movie, Angels & Demons. The place is a major crowd puller in Istanbul and carries a strong history since its conception in the 6th century. No matter how typical or off-beat your list of ‘Things not to Miss’ for Istanbul is, the sure way to beat the vacation blues and shopping fatigue is to go for a quick unwind session at a local pub and get some flavor of the Turkish pop music first-hand. The average price of the entry ticket came to around 40 TL, the crowd is rather friendly and the music groovy. Drinks or no drinks, this scored a big 10 on my list! Another mosque on the list, Sulemaniye is a visual treat for tired eyes. The mosque was built around 15th century and is one of the most beautiful mosques Istanbul boasts of. The highlights for me were the central fountain, the garden inside the mosque and the lovely view that the four minarets make along with their respective 10 balconies. And while you’re at it, don’t forget to check out the rooftop restaurants around it for a remarkable view of the city. My favourite pick? Sehri Saadet Cafe! A paradise for couples, the popular Bosphorus Cruise tour takes you on a stunning tour of the city by the bay. While it does need planning ahead, it’s an addition to your trip that you’ll not regret. Depending upon the time and the days you’re there, you can pick your options from a Short Circle Bosphorus Cruise, Full Bosphorus Cruise and the superstar of the lot, Full Bosphorus Cruise by night. Simply because sadly, I missed out on it. Despite travelling as a couple, this whole trip was a string of pleasant encounters with strangers and extending yourself to a new culture, a new perspective, one meeting at a time. So from Mohammad from Palestine, who is an ardent Bollywood fan to Aliza from Pakistan, who was clearly one of the most chilled out women I have come across to this gentleman, Erdogan, whom we met on our way to Suleymaniye Mosque where the conversation extended to a coffee affair at Starbucks and then an invitation for dinner at home – Life is wonderful when shared! All the photos on this trip were shot using the Samsung Galaxy S8+. I was literally thinking about the food in Istanbul. The best!